Blair House Care Home, Southport have skipped in to summer with their annual sun flower competition which has seen the competitive sides soar for both residents and staff alike. We now wait eagerly in anticipation for some lovely weather to aid all of our competitors. The aim of the competition is to see who can grow the tallest, brightest and of course the most elegant sunflower over the summer months. 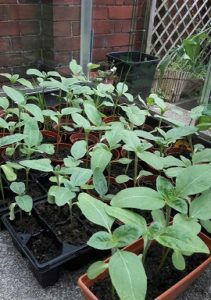 The competitors are currently keeping a close eye on their sunflowers by ensuring that they are watered regularly and kept in direct sunlight. The judges will make their decisions once all flowers have had their chance to bloom and prizes will be given to the winners so watch this space. Once the competition has taken place, a number of residents are already excited to take the sun flowers to their bedrooms to add that little bit of extra sparkle.